Talk about not letting roadkill go to waste. The elephants, giraffes and bears at the Oakland Zoo got to nosh on African jackfruit and bananas Wednesday thanks to a overturned big rig that dumped 60,000 pounds of fruit in Livermore near the Altamont Pass earlier in the week. "The elephants loved it," Brian Deering, president of the nonprofit F.A.I.R. Foundation, told NBC Bay Area. He masterminded the transfer – taking the lightly squished fruit from the side of Interstate Highway 580 and getting about 15,000 pounds of it to the animals at the zoo. About 35,000 pounds fed humans at the Alameda County Food Bank, and the rest was too badly bruised to be eaten. The truck is owned by All Seasons Produce in Oakland, which grows fruit in Mexico. Deering knows the owners, who contacted him after the truck tipped early Monday morning to say they didn't want the food to go to waste. He also knows the owners of Save Tow, who schlepped the tropical fruit to the zoo. Deering's agency, which has roots in Sunnyvale but now is headquarted in Elk Grove, is a nonprofit that connects families in custody battles with material goods, such as cars, dishwashers, computers and food. 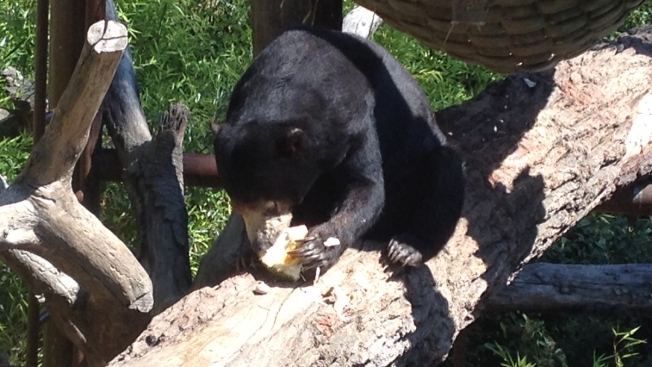 Zoo spokeswoman Nicky Mora said there is enough donated fruit for the elephants and bears to dine on all week.